Hello fellow bakers! I am so glad to be back on the Moda Bake Shop to share another easy pattern with you. As I mentioned in my previous post, I am fairly new to the quilting world and I am looking for something that is quick and easy. This quilt definitely fits the bill. The Jelly Roll Magic quilt is my 6th finished quilt and I love the way it turned out. I hope you do, too! Please check out my instagram page (@mona.phelps) for the most recent updates on what I’m working on. 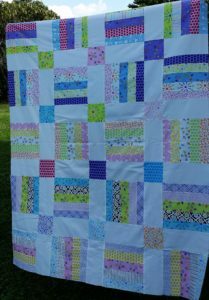 This quilt/project finishes at 53″ x 67″. I love jelly rolls, but I sometimes don’t know what to do with them. I wanted to come up with something that was more than sewing strips together. 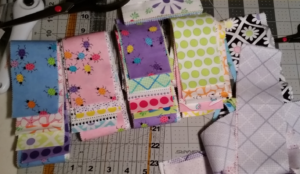 For Jelly Roll Magic, you are going to sew jelly roll strips together, cut them apart, mix together with some charms and other blocks and end up with an adorable quilt. Here is a sketch of what the finished product will look like. Note – all seams are 1/4″ unless noted otherwise. Sort your jelly roll strips into 5 sets of 5. When choosing the strips, you’ll want to decide if you want them to be different patterns/colors (this all depends on the color scheme of your jelly roll). You can see above how I sorted my strips. Now comes the fun part – the assembly!! 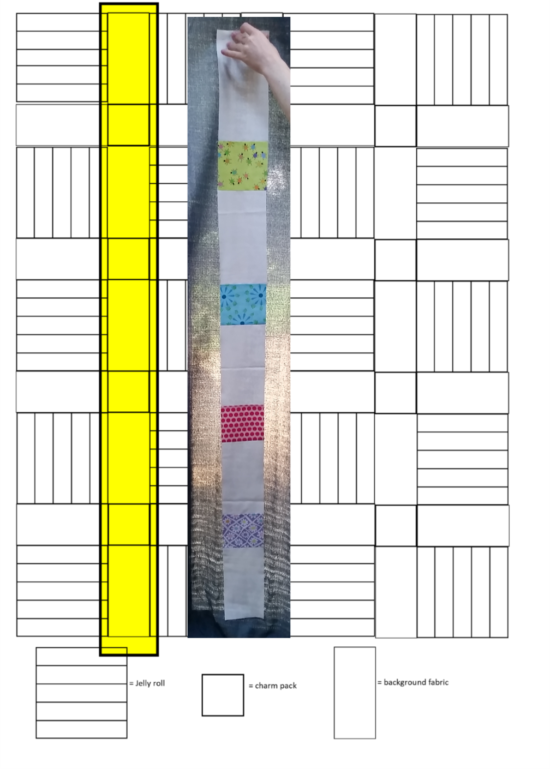 Wide Strips: Assemble 4 strips that will alternate the 10″ jelly roll blocks and the rectangle background fabric. 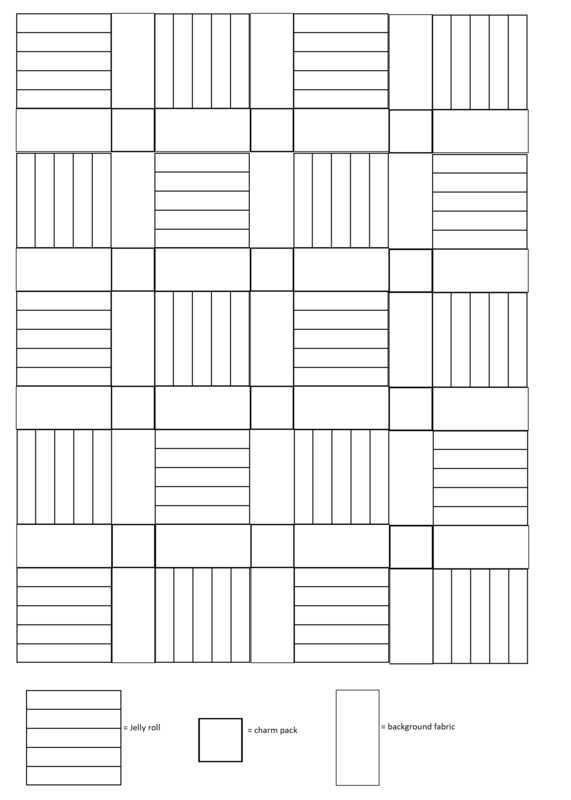 For each strip, you will need 5 blocks and 4 background rectangles. Start with one of the square blocks and attach one of the background rectangles. Before attaching the next square block, rotate the block 90 degrees so that the stripes go a different direction. Continue with the background rectangles and square blocks until you have a full strip, making sure to rotate each square block (see below for pattern and completed strip). Next, you will quilt and bind. 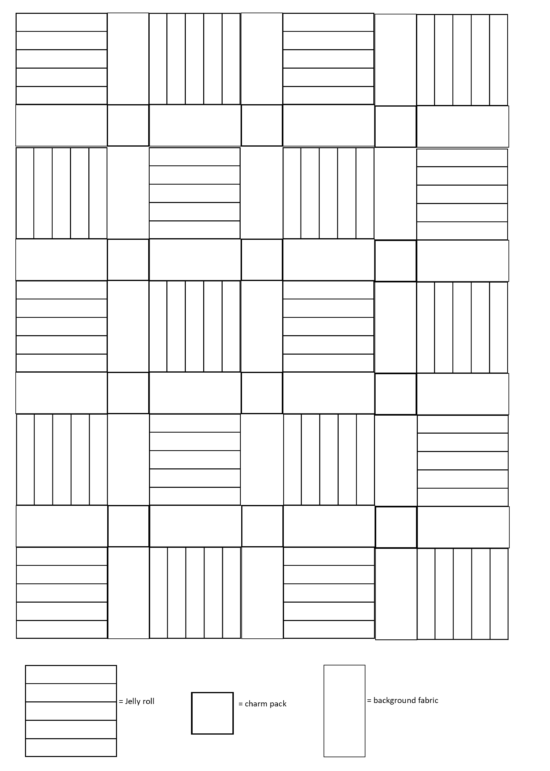 When organizing my 10″ square blocks, I keep all of the similar blocks on the same row. You can alternate these instead throughout the quilt for a scrappier design. Because I used a white background fabric, I used a white batting. For quilting, I used a variegated thread of primary colors. This quilt finishes at 53″ x 67″. I hope that you give this quilt a try. Leave a comment and let me know what Jelly Roll you will use! Enjoy – and happy baking! This entry was posted in Easy, Jelly Roll, Quilt and tagged Essentially Yours, Frolic, Grunge, Me and My Sister Designs. Mona this is just fantastic! 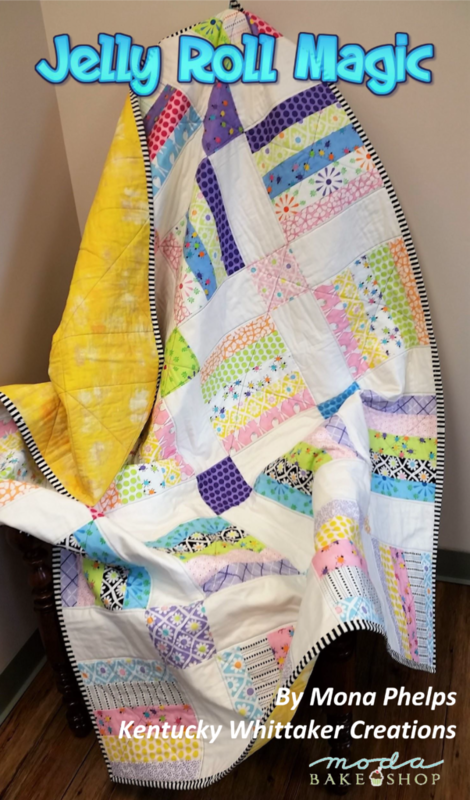 I think that I have to make this quilt using the eclectic elements collection, I have been eyeing that Jellyroll at my local quilt shop since it came out. Now I have the perfect excuse to buy it and the charm pack I have a couple of yards already stashed away, now what for the backing? Hmmm, must go shopping! Thanks again! Thank you for your kind words. Enjoy your shopping! Thanks for sharing something quick and easy. It is inspiring to see how nice the easy ones can look so good. I’m thinking I’d like to make this scrappy, I like the pattern a great deal. I think a dark background would really be nice too, especially for a boy charity quilt. I think a dark background would be great with this! And, scrappy, too! Would love to see a picture if you make one. Thank you! 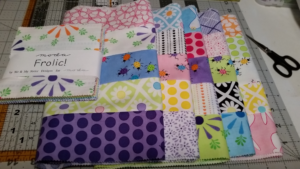 I just cannot wait to start on this quilt, it will be for my Great Niece!! Love this quilt (and the fabric – great choice!). Definitely going on my “to make” list. 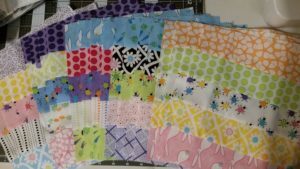 I have FOUR baby quilts to finish by December! I love having simple but striking quilt patterns in my stash. Thanks for your work on this. The directions and diagrams are clear. Now to hit my stash! Thank you for your sweet comments! 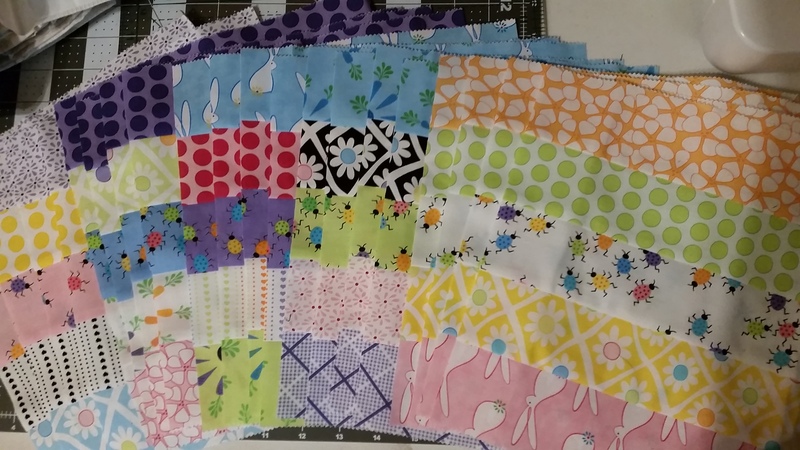 Good luck making all of those baby quilts! Great use of a jelly roll and charm pack. Love your design! 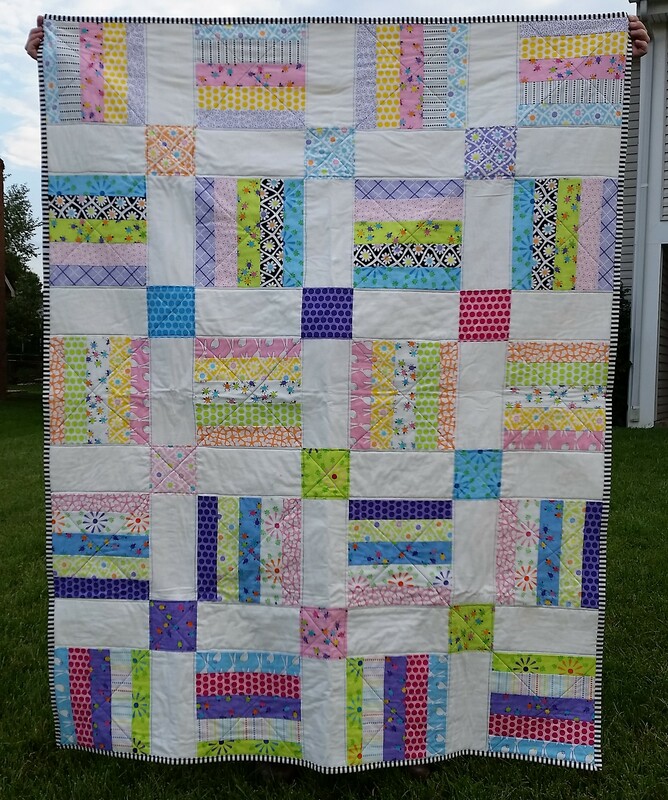 Such a cheerful quilt and a perfect one for Jellyrolls. I have a few that would look great in this design,Thank-you. Thank you – would love to see a pic if you make one! Question: do you really need 1 1/2 yards binding fabric? That’s A LOT of binding! No – I’m sorry about that. 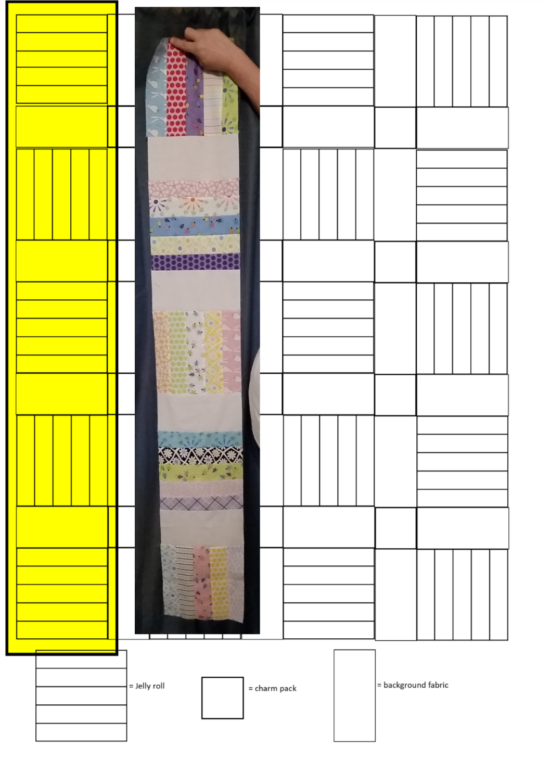 I am new to quilting and still trying to figure out all of the requirements! Love your quilt! I am thinking of making one with Halloween fabrics. Thanks for the great pattern. 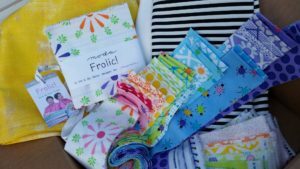 Thank you – I think it would be awesome with Halloween Fabrics! Great choice of fabrics! I always like a striped binding, and this one sets off the pattern perfectly. Thank you – I love striped binding and was really happy with how this turned out! Thanks for a simple to make but wonderful design! I love how you highlighted the strips that you were showing in each picture. As a visual learner, it helped me envision how this quilt went together. I love your idea of using Halloween fabrics as I just “happen” to have a lot of them. Think Christmas too! Thanks for sharing!!! Thank you for your lovely comments – I really appreciate it. Christmas and Halloween quilts would be adorable! 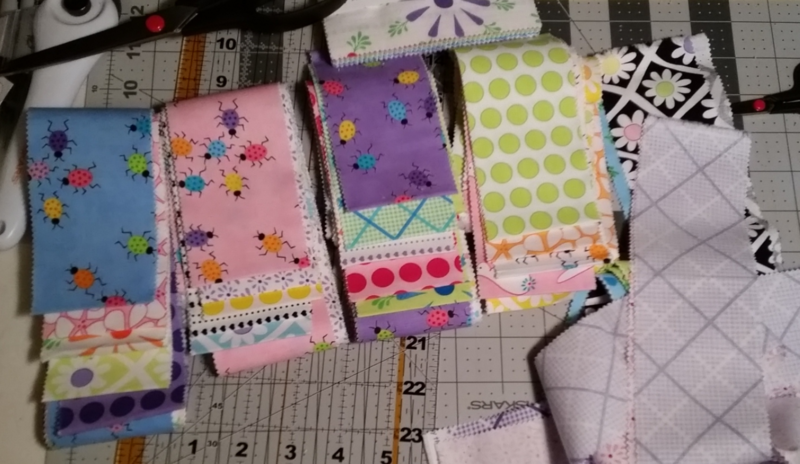 I’m thinking scrappy and I have a Mixed Bag Jelly Roll and I can use some solids for the cornerstones. Thanks for sharing this pattern! I think that would look great! Thanks! Instructions super clear and diagram with photos of strips is a perfect teach method.